Understand, interpret, discuss, and assess academic career strategies and development. Develop, articulate, and apply effective academic career development strategies in the context of your own research program. We will do this through a combination of readings, writings, activities, in-class discussions, and guest visits from MTS and TSB faculty. In addition to the reading and active participation in seminar discussions, there will be frequent written assignments for this course. Details of the assignments are provided below (or will be soon). You should complete assigned readings before beginning any written assignments for each week. All written assignments are due 24 hours before class (a.k.a. 9am on Tuesdays each week) via Canvas. Meeting these deadlines each week is important because you will also frequently be assigned a colleague's work to comment on and assess. Submitting your own work on time ensures that you can give and receive the full benefits of peer feedback. In general, your written assignments for this class can take a somewhat informal, but nevertheless professional tone. When submitting assignments via Canvas, I recommend either uploading files formatted as pdfs or using the WYSIWYG text editor provided in the Canvas discussion threads (I'll show you what I mean). It is your responsibility to ensure that you complete assignments fully and on time. Failure to do so reflects poorly on you and undermines the objectives of the class. Details on this syllabus will change, but I will not change readings or assignments less than one week before they are due. If I don't fill in a "To Be Determined" one week before it's due, it is dropped. If you plan to read more than one week ahead, contact me first. Keep an eye out for emails and announcements I send through Canvas re: updates to the syllabus. If you anticipate scheduling conflicts or require accommodations of any kind, please do your best to notify me well in advance. (In class reading) McPhee, Sarah. 2015. Habits of a highly effective graduate student. Ellison Center, University of Washington. Agre, Phil. 2002. Networking on the network: A guide to professional skills for PhD students (Sections 1-6). Rackham Graduate School. 2014. How to get the mentoring you want: A guide for graduate students (pdf). University of Michigan. Submit (via Canvas) a brief reflection (250-350 words or so) about the readings. Consider what you find surprising, insightful, anxiety provoking, puzzling, obnoxious, etc. Include 3 discussion provocations or questions with your reflection. These provocations should be designed to elicit an interesting and meaningful conversation in class. Talk to a 3rd or 4th year student in either the MTS or TSB program. Ask them about the professional communities they belong to, the conferences they attend, how they learned about these, and what they like/dislike about these communities. Come prepared to discuss your findings in class. The National Science Foundation Graduate Student Research Fellowship Program (NSFGRFP) Web site (Read fellowship description, application requirements, eligibility restrictions, and especially the Merit Review Principles and Criteria). Review the Northwestern TGS Fellowships site to identify at least three internal or external fellowships to which you realistically plan/want to apply. Example fellowship application (pdf on Canvas). Hargittai, Eszter. 2012. Learning from Others' CVs. Inside Higher Ed: Ph.Do column, December 14. Write a draft the "Research Statement" component of a fellowship application based on NSF GRFP requirements (length, formatting, content, etc.) or the requirements of another fellowship application of your choosing. Submit this via Canvas as a pdf. Review the CVs of one person from each of the following categories whose work resembles the kind you do or plan to do: (a) a current graduate student; (b) someone who received their PhD in 2012-2015; (c) a tenured faculty member at a peer institution. Identify the fellowships, grants, and funding sources each has received. Create a written version of this list for each of these three persons and bring it to class. Use the Nortwhestern Fellowships site and your investigation of CVs to build a list of fellowships you might apply for within the next year or so. Review your TSB or MTS program handbook (especially the milestones/timeline parts) and bring it to class. Henry, Alan. 2014. Productivity 101: A Primer to the Getting-Things-Done Philosophy. Lifehacker, March 26. Healy, Kieran. 2016. The Plain Person's Guide to Plain Text Social Science. Duke University. Interviews with at least three people from the "Professor" category of Usesthis.com. Keep a time diary for two work days prior to this week's class. Your time diary should record information about what you do when (including non-work things). Format/record the information however you like. Write a 250-400 word (or so) reflection on what you learn from your time diary. 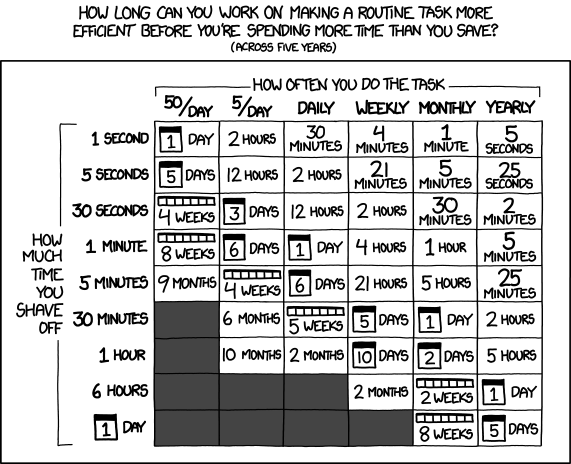 How did you spend your time? How much of it was work-related? How would you categorize how you spent your work time (e.g., classes, research, service)? How typical were these days for you? What changes do you anticipate/plan in the future? Submit your reflection via Canvas. Abbott, Andrew. 2004. Ideas and Puzzles, Chapter 7 in Methods of Discovery, W.W. Norton, NY. pp 211-248. Merton, Robert K. 1968. The Matthew Effect in Science. Science 159(3810): 56-63. Brewer, Marilynn B. 1991. The Social Self: On Being the Same and Different at the Same Time. Personality and Social Psychology Bulletin 17:475-482. (Optional) Cross, Nohria, and Parker. 2002. Six Myths About Informal Networks — and How to Overcome Them. MIT Sloan Management Review 43(3):67-75. (Optional) Hargittai, Eszter and Brayden King. 2013. You need a website. Insider Higher Ed: Ph.Do column, November 11. Search your partner's full name. See what results come up. Using a browser with no search/browsing history and without being logged in to any services (Gmail, Facebook, etc. ), conduct another search and see what comes up. Conduct yet another search for your classmate's name using a search engine that you do not use frequently/ever. A good option for many of you is probably DuckDuckGo. Repeat your searches with different configurations of your classmate's name (e.g., with/without middle names, with/without quotations, with/without institutional affiliation(s), etc.). Be creative. Write a brief analysis documenting what you learned. What did you learn through the quick/initial search? What did you learn through more involved/elaborate searches? Include links/screenshots as you deem appropriate. Also, be sure to conclude your analysis with at least three concrete recommendations for how this person can improve their online image? Share this analysis with your partner. Find 3 examples of current graduate students (at NU or elsewhere in any field) who you believe have a good online presence. Bring your examples with you to class and be prepared to explain/defend why you believe they make good examples as well as ways in which they might improve. Identify a topic you (might) study and how you would go about it. Identify the key findings and phenomena that motivate this work. What is the puzzle? Write the puzzle up in about a paragraph and submit it via Canvas. Hargittai, Eszter. 2010. The Case for Collaboration. Inside Higher Ed: Ph.Do column, August 27. APA Science Student Council. 2006. A Graduate Student's Guide to Determining Authorship Credit and Authorship Order. American Psychological Association. Shaw, Aaron. 2015. Hired Hands and Dubious Guesses: Adventures in Crowdsourced Data Collection, from Digital Confidential: The Secrets of Studying Behavior Online, edited by Eszter Hargittai and Christian Sandvig. Cambridge, MA: MIT Press. Find a more advanced graduate student who has published at least one paper involving at least one coauthor. Conduct a short (~20 minutes or so?) open-ended interview using the questions below as a guide. Make sure to take notes (or record the conversation with permission). Write up the key findings from your interview in about 500 words and post this to Canvas. Be sure to address any key takeaways or insights that you found especially new, surprising, or confusing. How were responsibilities divided in this collaboration (who was responsible for what)? How were decisions made about who would be responsible for what? How did you and your collaborator(s) manage your work across different stages of the project (from research design through data collection, analysis, writing up, reference management, peer review, and publication)? What social/technical systems did you use? What are things that went well in this collaboration? What are things that you would change next time you collaborate (with the same coauthor(s) or others)? King, Brayden. 2011. "The editors speak: what makes a good review?" (read the entire post and all the statements from the journal editors). OrgTheory Blog. Read the submission guidelines for the most important (according to you / your mentor(s)) venue in your field. Initial submission — (HCI conference in 2013). Final publication — Information, Communication & Society 2015. Full text of all reviews (including plenty of rejection letters!). Solicit a colleague or mentor for a high quality peer review (a good review, not necessarily one that was positive!) they have received recently from an important venue in your/their field. Write a brief (about 300-500 words) reflection on the reviewer comments distributed as part of the readings, those you solicited from a colleague or mentor, and any reviewer comments you have received. Be sure to identify and comment on elements of the reviews you find (1) most surprising; (2) most useful; (3) least useful and (4) any aspects of peer review that you want to discuss in class. Hargittai, Eszter. 2009. The Conference Scene. Inside Higher Ed: Ph.Do column, September 14. Hargittai, Eszter. 2009. Conference Do's and Don't's. Inside Higher Ed: Ph.Do column, October 19. Howard, Phil. 2015. A Dozen Slides. Inside Higher Ed, September 16. How is the organization running the conference structured? Who is in charge? Are there divisions? Administrative roles? Some other system? How is the conference itself organized? When are submissions due? What format are they due in? How do decisions about paper acceptance/rejection get made? How do reviews happen? Who determines what winds up on which panels and who goes where? How long are presentations? Are the proceedings published? Are they archival (count as publications)? Are there awards? Write up a brief (300-500 words) reflection on your observations. Emphasize points for further discussion in our class meeting. November 16 — Class cancelled. Varian, Hal. 1997. How to Build an Economic Model in Your Spare Time (pdf). In Passion and Craft: Economists at Work. Edited by Michael Szenberg, Univeristy of Michigan Press, Ann Arbor, MI. Submit your final project via Canvas. Closing ceremonies & festivities (6pm, off-site location TBA). Hargittai, Eszter. Archives of Ph.Do column. (Insider Higher Ed). Piled Higher and Deeper (PhD) Comics. Dance your PhD contest (check out past winners). "Power Pose" co-author Dana Carney statement (pdf) that she no longer believes the effects are real. Current story and background on problems with the original study. Overview of the Michael LaCour academic fraud scandal. Emergencies happen. Unanticipated obstacles arise. If you cannot make a deadline, please contact me to figure out a schedule that will work. If you must miss a class, contact me. You are responsible for obtaining class notes, handouts, assignments, etc. from fellow students in case of an absence. You are also responsible for delivering any assignments in a timely way even if you are not present in class.